D Ramai, T Pulisetty. Maternal And Caregiver Perceptions To Childhood Eye Care In Ghana. The Internet Journal of Epidemiology. 2013 Volume 11 Number 1. There are more than 1.4 million blind children in the world, 75% percent of whom live in developing countries. To reduce the prevalence of childhood blindness and associated diseases, attention is given to understand the role of mothers and female caregivers. To this end, maternal perceptions of eye care for children are thought to be fundamental in providing a better understanding of child eye care needs. As a result, tailored programs to reduce the global prevalence of blindness could be implemented. This study found that a large majority of mothers and female caregivers who had an eye examination had never brought their children for an eye exam. Additionally, though 94.6% of participants (limited to mothers and female caregivers) believed in the importance of an eye exam, the vast majority of participants did not consider bringing their children to a freely available clinic for eye examination. Participants’ major reasons (barriers) for not bringing their children included the belief that their child had no eye problems and the children’s unavailability during the daytime due to school or work. Further information was gained through the use of a five question “Yes / No” test on basic child eye care symptoms that provides insight for the development of future intervention programs. According to the World Health Organization (WHO), childhood blindness refers to diseases or conditions occurring in childhood or early adolescence, which (if left untreated,) may result in severe visual impairment or blindness that is likely to be untreatable later in life1. Of approximately 1.5 million blind children worldwide, seventy-five percent live in developing countries where roughly 500,000 cases of childhood blindness occur each year, with higher prevalence in lower-income populations2,3. Recent evidence shows that the number of children with functional low vision is estimated to be twice the prevalence of blindness among children4. In 1999, the WHO/International Agency for the Prevention of Blindness (IAPB) implemented VISION 2020: The Right to Sight, aimed to reduce the global prevalence of childhood blindness from 0.75 per 1000 to 0.4 per 1000 children3,5. Concomitantly, the WHO has categorized ocular impairment into five groups ranging from minor visual decay to blindness. This classification estimates that one million blind children live in Asia, 0.3 million in Africa, 0.1 million in Latin America, and 0.1 million in the rest of the world6. Though the number of cases of blindness in children is lower than the rate among adults, the effects are still severe. Children suffering from visual impairment are a social, emotional, and economic challenge for their families, and are less likely to attend school and find work. Some conditions associated with visual loss also cause child mortality, including premature birth, measles, congenital rubella syndrome, and vitamin A deficiency7. Thus, eye care and childhood health are closely linked, and it is crucial that visual problems be treated as early as possible, as it might not be possible to correct many conditions later. A variety of pathological and etiological factors can cause severe visual impairment and blindness. An estimated 30%-72% of such blindness is avoidable in developing countries, 9%-58% is preventable, and 14%-31% is treatable6. Though its rate has declined, the leading source of childhood blindness in low income countries has been linked to corneal scarring, caused by vitamin A deficiency and measles.8,9 Corneal disease accounts for 70% of childhood blindness cases in Africa and Asia8. To meet this global crisis, the WHO has prioritized combating childhood blindness by listing primary health care as the most important factor for early identification of eye disease symptoms. In addition, specific and decisive actions are outlined for disease control and human resources development in accordance with VISION 2020 program 3 (Figure 1). To this end, mothers and women of child-bearing age have been acknowledged as targets, and have been selected for focus groups. While much emphasis lies in prevention, information regarding the perceptions held by mothers and female caregivers toward eye care for children is still limited. This knowledge deficiency curtails the development of effective intervention and health care programs. Previous studies have summarized general perceptions held by community members, indicating that blindness is perceived as an escalating crisis that villagers blamed on germs as a primary cause, while cost, fear, gender inequalities, and local beliefs were identified as primary barriers7,11,12. This study endeavors to provide an understanding of underlying barriers affecting mothers and female caregivers from the uptake of eye care services for their children in addition to their perceptions toward eye health. 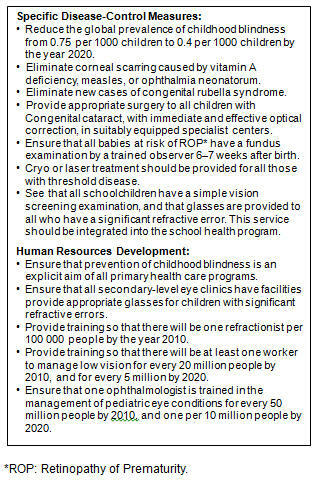 VISION 2020 targets for the control of blindness in children. In the 2-month period of June and July, 2011, daily outreaches were planned and operated by Ghanaian eye clinics through their partnership with Unite For Sight, a non-governmental organization (NGO). These clinics are located in the Accra and Kumasi region of Ghana, and treat patients living in villages up to a seven-hour drive away. Patients (including children) received eye care services from optometric nurses and doctors of Save The Nation’s Sight Eye Clinic, Charity Eye Centre, Northwestern Eye Centre, and Crystal Eye Clinic through these outreach programs. All adult female participants who attended outreach clinics and received eye care services were asked whether they would be willing to participate in a research study. Ultimately, two hundred participants enrolled, consisting of mothers and adult females (not involving minors). Three original enrollees declined to participate citing time as their main concern. Eligible mothers and female caregivers were defined as those who had children of their own or looked after children (based on the UNICEF definition of a child as someone less than sixteen years of age). Participants were interviewed individually and questions including demographic information, a poverty scorecard designed by Microfinance Risk Management13, patient history relating to eye health, and objective questions assessing eye care knowledge. The questions relating to eye care knowledge asked participants whether they believed that an eye problem could cause any of five outcomes in children: frequent headaches, rubbing eyes, squinting, difficulty in school, and ear pain (All are clinically related to eye problems except for ear pain). These five questions were chosen because they involve easily noticeable conditions in both rural and urban Ghanaian communities, according to local clinics. Hypothetically, female caregivers who can sufficiently suspect that a child has an eye problem should answer the majority of these questions correctly. Additionally, bivariate cross-comparisons of the responses to pairs of questions can be used to check for particular discrepancies in the response of female caregivers to eye health care (i.e. difference in proportions of mothers with eye exams vs. children with eye exams). To overcome language barriers, a local volunteer affiliated with the eye clinics served as an interpreter. Statistical analysis was performed with JMP-Professional statistical software. Study protocol was approved by the Institutional Review Boards of York College of The City University of New York, Jamaica, New York, and Duke University, Durham, North Carolina, in addition to the aforementioned clinics and Unite For Sight, Inc. No other institutional research approval was mandatory for this study in Ghana. Eye Exams Among Mothers, Female Caregivers and Children. Of the 200 interviewees, 130 individuals responded to two specific questions regarding whether they had ever had an eye examination and whether their children had ever had an eye examination (and 122 of these 130 individuals had children of their own). Of these 122 individuals, 77 reported that they had an eye examination in the past, and of these 77 individuals, 72.7% cited that their children had never had an eye examination. Among the rest of the 45 adults that had not had an eye examination, 82.2% said that their children had never received an eye examination, showing no significant difference in proportion (2 sample 2-sided z-test for difference in proportions, H0: prop-1=prop2, p-value=0.24) (Table 1). A chi-squared test of independence for this fit yields a p-value of 0.53 (χ2=2.23, df=3), showing no significant evidence of dependence between whether the adult had had an eye exam and whether the children had had an eye examination. Exclusion of those who answered “do not know” and those who had no children also yields an insignificant p-value (p=0.3929, χ2=0.73, df=1), further implying independence between the two variables. Additionally, while 94.6% of all participants believed an eye examination was beneficial to children, only 21.5% overall brought their children to the outreach (on that day) to receive an eye examination and only 20.9% had children who previously had an eye examination. Reported Barriers To Uptake of Child Eye Care. 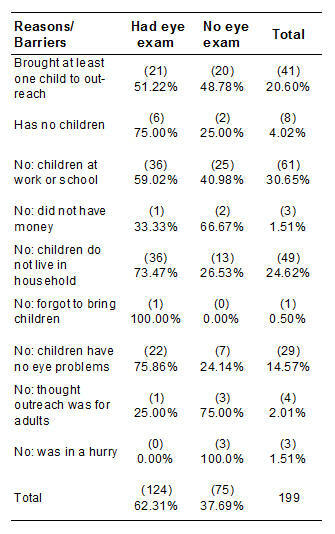 Participants' responses to the two questions—whether they had an eye examination and whether or not they brought their children to the outreach–plus their reason for bringing or not bringing their children is described (Table 2). 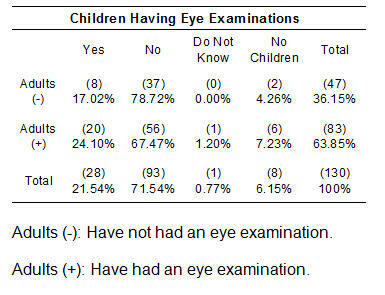 Of those that had an eye examination, 16.9% brought at least one child to the outreach; of those that did not have an eye examination, 26.7% had brought at least one child to the outreach, showing no significant difference in proportions (2-sample 2-sided z-test for difference in proportions, H0: prop1=prop2, p-value=0.1). (Table 2.) Additionally, of those whose children did not have an eye examination, 16.1% brought at least one child to the outreach, while of those whose children previously had an eye exam , 29.6% brought at least one child, showing no significant difference in proportions (2-sample 2-sided z-test for difference in proportions, H0: prop1=prop2, p-value=0.12). Knowledge of Eye Disease Prevention. Of those who previously had an eye examination and answered all questions relating to eye disease prevention, 8.0% of participants correctly answered all questions, while 8.0% of those who did not have an eye examination correctly answered all such questions, showing no significant difference in proportions. Figure 2 shows (for each of the five questions) the percentage of participants who answered correctly, answered incorrectly, or did not know the answer (“do not know”) (Figure 2). A comparison between participants with and without children revealed that the latter group was most likely to correctly answer the questions related to eye disease prevention. Of this group, 25.0% answered all such questions correctly, while of those who did have children, 7.3% answered all correctly, showing a significant difference in proportions (2-sample 2-sided z-test for difference in proportions, H0: prop1=prop2, p-value=0.03). Bivariate data of mothers and female caregivers showing if they had eye examinations compared to whether children had eye examinations. Each cell contains the actual count (in parentheses) of participants that fall into the specified category, along with the row percentages. Bivariate data of mothers and female caregivers showing if they had an eye examination against their reasons for or for not bringing children to outreach. Each cell contains the actual count (in parentheses) of participants that fall into the specified category, along with the row percentage. 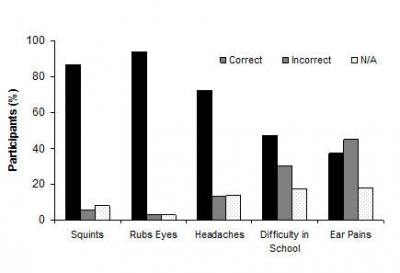 Participants response (%) to five Yes/ No questions assessing eye disease prevention knowledge: Are the following related to eye problems if a child frequently: (1) squints, (2) rubs eyes, (3) has headaches, (4) has difficulty in school, (5) has ear pains. All of these, excluding ear pain, is clinically related to eye health. Results obtained in this study confirm that eye health education and awareness efforts can help eliminate preventable blindness. Though there is no way to confirm whether a patient indeed had an previous eye examination by an eye doctor, there is insightful data associated with participants’ correct answers to the eye health questions. Indeed, the proportion of participants who answered the eye health questions correctly did not significantly differ from those who reported that they previously had an eye examination and those who did not have an eye examination suggests that upon receiving an eye examination by a professional, an individual may not learn sufficient information about ocular diseases. It is possible that the patients did not receive an exam from an eye doctor, and it is also possible that the patients previously saw an eye doctor who did not include education as part of their exam. One possible way to more effectively raise awareness might be distribution of culturally-appropriate, locally-developed posters or other visual aids inside clinics that administer eye examinations, in the hopes of educating those who come to have their eyes checked about signs and symptoms of eye disease. Hill et al. noted that flyers and posters are a more reliable way to increase public health awareness than are word of mouth and other media. Additionally, this discrepancy might be remedied by improving physician-patient discussions on eye health during exams. Training community health workers to supplement discussion with a physician may also be a way to increase knowledge of eye care and associated diseases. Incidentally, the twenty women in the study who were not mothers of children had the highest rate of correctly answering questions related to eye healthcare and eye disease prevention. It is estimated that 49% of the Ghanaian female population experience motherhood by the age of 20 and an average age of first marriage at 19yrs 14. An age at which women experience motherhood early in life may suggest a reason for attaining lower scores on eye health. These young mothers are likely to be preoccupied with child rearing practices than education in general. This would highlight the need to direct educational efforts more strongly to mothers. While almost all participants (94.6%) believed in the benefits of eye examinations for children, only a small proportion brought their children to the outreach (21.5%), and a fraction of participants had children who received an eye exam in the past (20.9%). Barriers observed were time away from work, money, and lack of information about the outreach program (some participants were not aware that children could receive eye care services at the outreach). This study supports prior work that found several barriers impeding access to eye care. Reports showed that transportation and distance to an eye examination provider is a dominant barrier, as are limited trust in eye health care providers, lack of effective communication with the provider, and cost of care15. Its was found that besides having a lower literacy rate than males, women have less disposable income, and less control of household finances16, 17. This financial constriction may result in mothers attending a clinic and using their experience as a base line to assess her child’s eye care needs. In fact, studies report that a major barrier to child eye care were mothers’, (or parents’ in general), belief that their children had no eye problems. Our study reported a like response of 14.6% from the sample. Because children in general do not often complain of eye symptoms, followed by the difficulty in detecting these symptoms from someone untrained, this compounds the false notion that mothers’ would believe that their child has no eye problems18. Mothers and caregivers who did not bring their children because they were in a hurry, did not have money, or did not know that the clinical outreach program was for children had a lower prevalence of having had an eye examination when compared to those that gave other answers to the question of whether or not they brought their children to the outreach. The theme of barriers is present in these reasons—time barriers, financial barriers, and information/communication barriers. No statistical relationship between poverty score and access to eye examinations was observed. These barriers may explain why the aforementioned group was not able to previously access eye examinations by eye doctors. The value of collaborations with local eye clinics and NGOs such as Unite For Sight aids in supporting local doctors as they bring quality eye care to patients in their villages. Furthermore, this study found that those who brought their children for an eye examination were less likely to have historically purchased medicines (at a hospital, clinic, or pharmacy) for their children than those who did not bring any of their children. This might imply that these caregivers self-prescribed medication instead of coordinating an eye exam for the child by an eye doctor. This discrepancy in perceived self-efficacy could be remedied via specially formulated education programs about childhood eye care or general pediatric health care. One potential shortcoming of the study is the inferential bias based on the concept of a simple random sample of subjects, without addressing nonresponse bias, because whether or not a subject responded in the interview is itself a variable. Additionally, the perceived differences in subject responses between data collection sites were assumed to be negligible. Our study was conducted throughout rural villages in Ghana where proper eye care is inaccessible to the majority of inhabitants. Finances, transportation, a shortage of physicians, and most importantly – knowledge, hinder locals from receiving care. An extrapolation of the results from this study will likely be applicable only locally. However, the authors hope that it may have an impact on the policies and approach taken by local governments, and non-profit organizations such as Unite For Sight in addressing health care needs. We emphasize that health care outreach programs should dedicate a better part of their time in delivering adequate knowledge, so as to prevent eye diseases, and diseases in general. This research was supported by travel grants from the Department of Chemistry (York College), York College Association’s Study Abroad Fund, and the DukeEngage program of Duke University. Ethical approval for this study was obtained through the Institutional Review Boards of York College of The City University of New York, Jamaica, New York (IRB# 11-05-016-0147), and Duke University, Durham, North Carolina (IRB# A05). Additional approval for this study was given by Unite For Sight Inc. (USA), Save The Nation’s Sight Eye Clinic, Charity Eye Centre, Northwestern Eye Centre, and Crystal Eye Clinic (Ghana). The authors would like to thank Unite For Sight, Inc. for coordinating outreach programs, access to clinics and patients, and assisting in completing this study. The authors would also like to thank Dr. Sumedha Ariely (DU) and Dr. Deb Chakravarti (YC) for critical revision of the manuscript and advisement. 2. Gilbert C, Foster A. Blindness in children: control priorities and research opportunities. British Journal of Ophthalmology. 2001; 85(9): 1025-7. 3. New issues in childhood blindness. Community Eye Health Journal. 2001; 14(40): 53-6. 4. Gilbert C, Muhit M. Twenty years of blindness: what have we learned? Community Eye Health Journal. 2008; 21(67): 46–47. 5. Steinkuller PG, Du L, Gilbert C, Foster A, Collins ML, Coats DK. Childhood Blindness. Journal of the American Association for Pediatric Ophthalmology and Strabismus. 1999; 3(1): 26-32. 6. Gilbert, C., & Foster, A. (2001). Childhood blindness in the context of VISION 2020 – The Right to Sight. Bulletin of the World Health Organization. 2001; 79(3): 227-32. 7. Ashaye A, Ajuwon AJ, Adeoti C. Perception of blindness and blinding eye conditions in rural communities. Journal of the National Medical Association. 2006; 98(6): 887-93. 8. Preventing blindness in children. Report of a WHO/IAPB scientific meeting. Hyderabad, India. 2000; WHO/PBL/00.77. 10. Hill Z, Kirkwood B, Kendall C, Adjei E, Arthur P, Agyemang CT. Factors that affect the adoption and maintenance of weekly vitamin A supplementation among women in Ghana. Public Health Nutrition. 2007; 10(8): 827-33. 11. Bronsard A, Shirima S. Cataract surgery: ensuring equal access for boys and girls. Community Eye Health Journal. 2009; 22(70): 28–29. 12. Bronsard A, Geneau R, Shirima S, Courtright P, Mwende J. Why are Children Brought Late for Cataract Surgery? Qualitative Findings from Tanzania. 2008; 15(6): 383-388. 13. Schreiner M, Woller G. A Simple Poverty Scorecard for Ghana. 2010. [accessed 31 Mar. 2012] http://www.microfinance.com/English/Papers/Scoring_Poverty_Ghana_EN_2005.pdf. 15. Donoghue, M. People Who Don’t Use Eye Services: ‘Making the Invisible Visible.’ Journal of Community Eye Health. 12.31 (1999): 36-38. 16. Chang, M.A., Condon, N.G., Baker, S.K., Bloem, M.W., Savage, H. and Sommer, A. The surgical management of cataract: barriers, best practices, and outcomes. International Ophthalmology. 2008; 28(4); 247-260. 17. Lewallen, S. and Courtright, P. Gender and use of cataract surgical services in developing countries. Bulletin of the World Health Organization. 2002; 80(4); 300-303. 18. Mohammad A.M., Childhood Cataract: Home to Hospital. Community Eye Health. 2004; 17(50): 19–22.